One of the most fun and easy to set up aspects of fundraising can be using raffles, lotteries and lucky dips. They're so easy to implement that they can be used at all sizes and varieties of venues and can cater to any age group. As with all fundraising, it's important to know the legal aspects of running your campaign and below are some of the crucial rules regarding raffles, lotteries and lucky dips. What Defines a Raffle or a Lottery? Many people have participated in a raffle, lottery or lucky dip before but few are able to clearly define what exactly constitutes a lottery and what the legal aspects of one are. There are some easy ways to define a lottery and raffles, lucky dips, tombolas, sweepstakes and lotteries are actually all fairly similar. Any kind of draw where participants have to pay money to have an equal chance of winning a prize is actually defined as a lottery. A little known fact is that all lotteries are actually illegal unless they meet the requirements of the Lotteries and Amusements Act 1976. This means that before you go arranging a fundraising event around a lottery, you must ensure that it is either not considered to be a lottery or qualifies as what is known as an exempt lottery. For most people involved in one off fundraising, their lottery will qualify for the criteria set to be an exempt lottery. This involves any lottery taking place during events such as a fete, charity fundraising bazaar, sporting event, dance or other entertainment event. The event can be held on a single day or even carried over two days - this still classifies as an exempt lottery. A small lottery is one of the most common types of fundraising as it is normally used as an additional way of raising funds during an event that may be a one-off. In order to run a successful small lottery, you can seek donations of prizes from any number of businesses, but must never spend more than 250 GBP on prizes. You can have as many donated prizes as you wish, but aren't allowed to offer cash as a prize. Instead, you can offer vouchers to establishments or any kind of prize. Small lotteries always need to be run as part of another event such as a pub quiz, charity fete or fundraising dinner. When you sell the tickets, it must be during the event and the draw must also be during the event. This of course means that all ticket sales must be to people who actually attend the event, so the more people you have attending the better your chances of raising more funds. 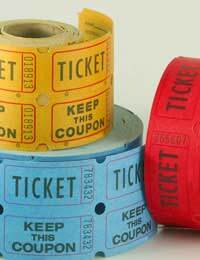 A society lottery can be set up to sell tickets to the public over a period of time. They are normally used by larger charity groups and the local authority needs to regulate the rules for the lottery. If sales of the tickets for a single event are likely to be in excess of 20,000 GBP or over 250,000GBP over the course of a year then the lottery has to be registered with the Gambling Commission. When you start a lottery of this type, you should be aware that you can't charge any more that 2GBP for a ticket. Check with your local authority for more information on this. A private lottery is a lottery that can take place within a workplace or other organisation. The tickets can be sold only to people who live or work at the same place and all the takings from the lottery has to be split between prizes and the organisation. This is a less common way of fundraising, but some people do organise these simply because it's easier to sell tickets to people you already know and spend time with. As with any fundraising, it's important to understand the legal aspects of what you're doing. If you're running a society lottery, you must have the price of the ticket printed on it, the name of the charity, the date of the lottery, the name and address of the promoter and the charity number. If in doubt, check with the Gambling Commission for further information. Needless to say running any kind of lottery for charity can be very beneficial for the chosen charity or fundraising cause. One of the main benefits is that you can obtain prizes as donations so don't have to spend a lot of money on prizes. Another is that income from private and small lotteries will be exempt from tax so all the money you raise stays with you. They're also very easy to set up and get people to buy into, so use this as one of your first attempts at fundraising. I want to hold a lucky dip for customers where they pick a number to win a prize in my shop, no tickets but instant win all monies go towards local charity. Prizes will be under £50 do I need a licence for this? Contact the charity for which you're raising the money. They'll be able to help you do what's within the law if they are properly registered charity. I am a tesco colleague and tesco are working to support diabetes uk and british heart foundation. To raise money in our store we would like to hold a lucky dip raffle. Basically 50p per play. Pull out a ballot from a bag and see if the number on your ballot matches the mumber on any of the prizes. Do we need to apply to the coucil for a licence to do this? @saffy. Did you find this Guide on the gambling commission website? It seems pretty clear but if there's a specific question you have then raise it here and maybe we or our other readers can help.